Russell James has crafted a great horror adventure! The book opens up with a bang and doesn’t let up until the excellent conclusion. Grant Coleman, a broke and desperate paleontologist, gets the chance of a lifetime exploring an ancient cave system In the Yellow Stone National Park that has never been explored before. He jumps at the chance. Afterall, he needs the money for his research. Grant is greatly disappointed when he discovers that the guy who hired him is doing a documentary film on the cavern. NPS Ranger McKinley Stinson finds a bull who has been slaughtered by bats. She tracks the bats back to a cave opening in the Yellow Stone National Park. McKinley is about to arrest Grant and the other members of the exploring team, but the roof of the cave collapses, trapping everyone inside. The only way out is to go deeper into the cave system. The explorers will have to survive the elements and the ancient creatures that dwell in the cavern. 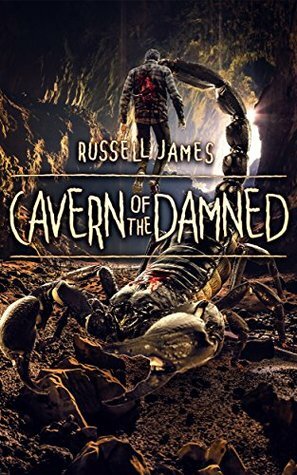 Cavern of the Damned is filled with dread, death, ancient creatures, betrayal, and bad guys. Will the explorers survive? I enjoyed this book! I hope this becomes a series featuring Grant Coleman! I highly recommend this book to fans of horror and adventure!